Aizawl, Jan 28 : Close to 500 families of the Bru tribe have reported to the Mizoram government that they have “self-repatriated” themselves into the state from relief camps in Tripura since the last formal process in June last year, when less than 280 families returned. Combined with the more than 530 families who have returned home on their own in the past, the data appears to underline the increasing desire by many to return home, often in secret, from almost two decades of squalid exile despite resistance by community leaders at the camps who want better rehabilitation packages and security. In all, a little less than 670 families have come home under the formal process, which involves both the Tripura and Mizoram governments announcing dates, arranging for transportation and setting up stalls to facilitate their return. These formal processes almost always clash with shows of resistance by Bru leaders in the camps, who organize roadblocks and dharnas there to discourage those who want to return. These have been apparently successful, for example in 2012, only seven families returned under the formal process. On the other hand, as many as 573 families have chosen the “self-repatriation” route in which they sneak out of the camps and simply head towards and cross the inter-state border, only later informing Mizoram government authorities of their return and thus eligibility for the rehabilitation package. The close to 500 families (455 of them to Mamit district, between 20 and 30 others in Kolasib district) who have reported they have come home on their own await formal verification and thus have not yet been given the rehabilitation packages. As things stand, what is left of the Mizoram government’s funds for their rehabilitation will no longer be able to meet the expenses required to rehabilitate these almost 500 families if they are all found to be legitimate returnees. 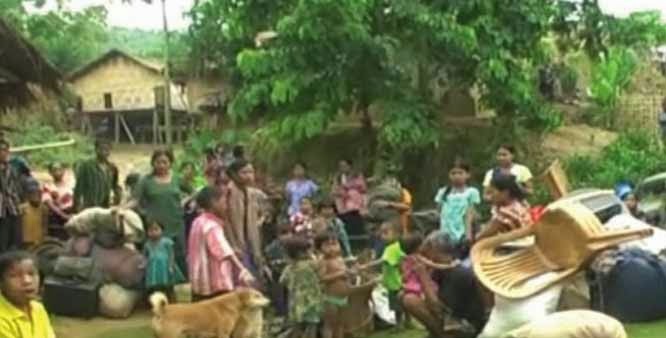 Thousands of families from the Bru tribe fled ethnic tension in Mizoram and settled in Tripura as refugees 18 years ago, where they live in six squalid relief camps. The Tripura government disallows them from owning land – including for farms – elsewhere, provides them no work under the MGNREGS while they are also not entitled to vote for state elections. The Brus perforce live on cash and ration doles – Rs 5 per adult per day (Rs 2.50 for minors), 600 grams of rice per adult per day (250 grams for minors) plus Rs 10 per months each to every family for purchasing cooking oil. The social justice bench of the Supreme Court had earlier this month rapped the centre for providing meagre compensation, and also termed “highly objectionable” the government’s reasoning for the paltry hand-outs – better camp conditions would make the Brus disinclined to return to Mizoram. The judges’ anger elicited an apology from the Additional Solicitor General. But Bru leaders have been saying the same thing – that Tripura treats them badly so they are forced to vacate the relief camp land, much of which they say has already been given to local tribals under the FRA. They also say the state government fears their permanent residence in Tripura because that would greatly add to the tribal population there. Tripura has for generations seen ethnic, often violent, conflict between its Bengali and tribal communities, the latter once in majority but overrun by the former within a few decades after India’s independence and the establishment of East Pakistan and, later, Bangladesh.